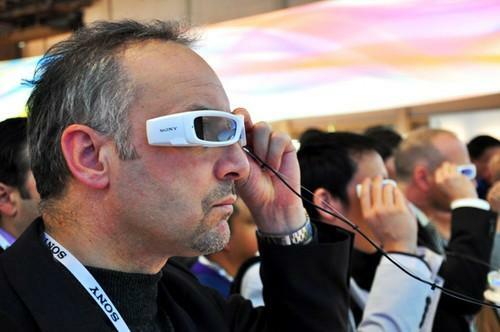 Sony's SmartEyeglass prototype is shown off at CES 2014 in Las Vegas in January. Sony's wearables could work with cameras, game consoles and other electronics in the future while becoming more camera-like and TV-like themselves, Sony President and CEO Kazuo Hirai said Monday. Sony wants to bring its leading-edge image sensors and display technologies to wearables to make them stand out from competitors, he said in a discussion at Sony's Tokyo headquarters. Wearables that work with other gear including PlayStation consoles "have a lot of potential to make it a more exciting ecosystem," Hirai said. "It's not just the wearable but it's in fact an extension of a lot of the product experiences that we bring to consumers today." Hirai believes that Sony can use its technological prowess, including strength in batteries, and vast content assets to make something of its entry into the wearables market. Since the launch of its first SmartWatch in 2012, it has gone on to announce a slew of wearable devices including the SmartBand life-logging wristband that's powered by the Android-linked Core fitness sensor. That wristband is the first of Sony's SmartWear Experience that's aimed at going beyond fitness into entertainment. The company's initial strategy in the nascent wearables market comes as it exits the PC business. Hirai didn't specify how wearables would advance Sony's corporate strategy, but emphasized that the rules of the business have yet to be written. "It already is, perhaps, a very crowded market," he said. "I think the jury's still out on exactly what the right wearable consumer experience is... We have a vision of where we want to take it, but we don't know whether that's the right one. We don't know whether Google has the right answer. Everyone is scrambling for that right consumer experience at this point." Sony has also unveiled concept wearables including Project Morpheus, a virtual reality headset for the PlayStation 4 console, the Lifelog wearable camera and a potential Google Glass competitor called SmartEyeglass that can be used as an augmented reality display for directions or other information. Hirai hinted that Sony has more concept-grade wearables to come, saying there's "some real funky stuff" going on at the company's technology research center in Atsugi southwest of Tokyo. Despite strong PlayStation 4 sales, the struggling electronics giant's decision to sell off its Vaio laptops unit led it to a ¥128.4 billion (US$1.25 billion) loss in the year to March 31. It expects a loss of ¥50 billion for the current year and pledged intense restructuring. Asked about Sony's loss-making consumer TV business, which is slated to become a split-out company called Sony Visual Products, Hirai said that exiting television would entail enormous costs, but he didn't rule out the possibility. "Not that there are any plans right now, but just talking generally, I think that the options we would pursue if it came to that would be some sort of a partnership with an outside company or basically getting some partnerships going in some particular territories," Hirai said. "Having said that, right now we are in the midst of creating a new company, Sony Visual Products, to make sure that the TV business is a stand-alone business."